The beauty of Disney's princesses is sure to make your little Princess' day! On the outside, she will be welcomed with smiles from Ariel, Cinderella, Tiana, Belle, Jasmine, Aurora and Snow White, all ready for the ball. 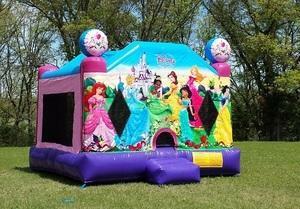 The Disney Princess Bounce House features an inflatable safety ramp at the entrance to protect excited kids as they scramble to get inside the bouncer. Once up the ramp, there is a netted crawl-through opening that makes it easy for young children to get inside, but the safety closure makes it difficult for them to fall out. 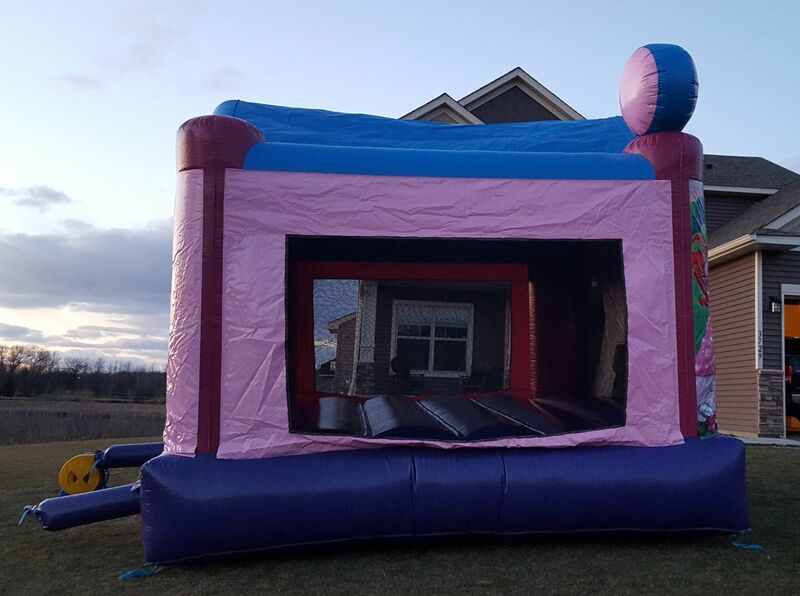 Inside, this bouncer has a large and spacious jumping area and can accommodate up to 8 participants at a time. It also has large netted vent windows that allow for fresh air-flow that keeps your active kids cool in the summer and also makes supervision of the activities inside the Princess House a breeze! Overhead, there is a tiered covered roof that provides shade over the entire bounce house. To top it off, there are two large and pretty princess crowns soaring overhead as the excited kids jump inside! Visitors will rule this bouncy house kingdom, with plenty of room for bouncing fun all day long and a bit of nobility inside!